The American Publishing Company's Popular Edition was mentioned in a letter dated 20 April 1898 when publisher Frank Bliss wrote to Henry Rogers laying out his plans and expectations for the uniform edition. Bliss reported he had orders from one of his agents for not less than 8,500 sets of the Popular Edition. Bliss planned to sell the Popular Edition for $50 after the more expensive numbered editions had been marketed. No sales figures or production numbers for the Popular Edition have been found. In the fall of 1901 when a controversy arose over advertising techniques to sell the uniform editions, Robert G. Newbegin wrote to Clemens that he had sold 500 sets of the Popular Edition to Chicago book dealer Washington Irving Squire (b. 25 Oct. 1844). Newbegin blamed Squire for printing and mailing out letters featuring Clemens's fraudulent signature asking customers to buy his books. Newbegin claimed he had informed Squire that his firm would not be a party to such sales tactics and he felt the practice had been discontinued. A threatened lawsuit against Squire by Clemens was dropped when Squire died on October 9, 1901 in Toledo, Ohio. Production numbers for the Popular Edition were not disclosed in 1903 when George Gilman, attorney for the American Publishing Company, reported the company's production numbers to John Larkin, an attorney for Harper and Brothers prior to the Harper buyout of American Publishing Company. Gilman's letter makes no mention of the Popular Edition. 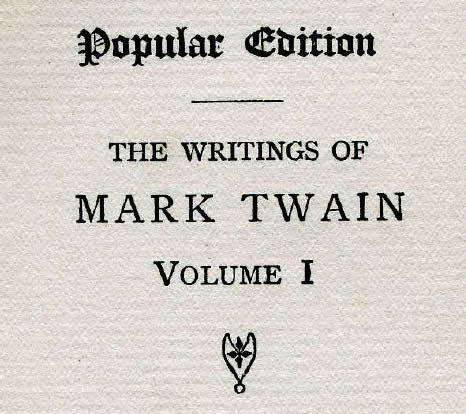 When editors Henry Nash Smith and William M. Gibson edited the 1960 edition of Mark Twain-Howells Letters, they surmised "the 'Popular Edition' was finally called the 'Royal Edition," thus establishing the possibility that the Popular Edition was never published (Mark Twain-Howells Letters, Vol. 2, p. 683). Previous studies of the uniform editions of Mark Twain's works by Robert Rodney and Merle Johnson make no mention of the Popular Edition. No copies of the Popular Edition are recorded in the WorldCat library database as being held by any library worldwide. No copies of the Popular Edition are listed in online book sellers' inventories. In November 2010 David Lamar reported the existence of a set of the Popular Edition formerly owned by Robert Gilchrist Hunt (b. in 1871) and a former Chicago resident. Lamar has graciously provided information related to these volumes. The Popular Edition flyleaf appears in every volume of the edition. Scan courtesy of David Lamar. Lamar, David. Personal correspondence, 12 November 2010. Smith, Henry Nash and William M. Gibson, eds. Mark Twain-Howells Letters, Volume 2. (Harvard University Press, 1960).